Making My 6th Doctor Costume: Smaller on the INSIDE! 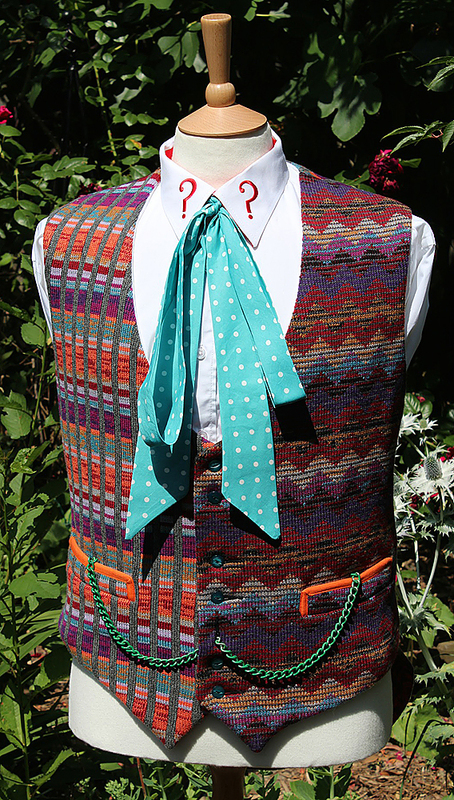 This week signals a special landmark in my tailoring work. Up until now all my tailoring has been done in classic cottage industry fashion on the kitchen table - literally! 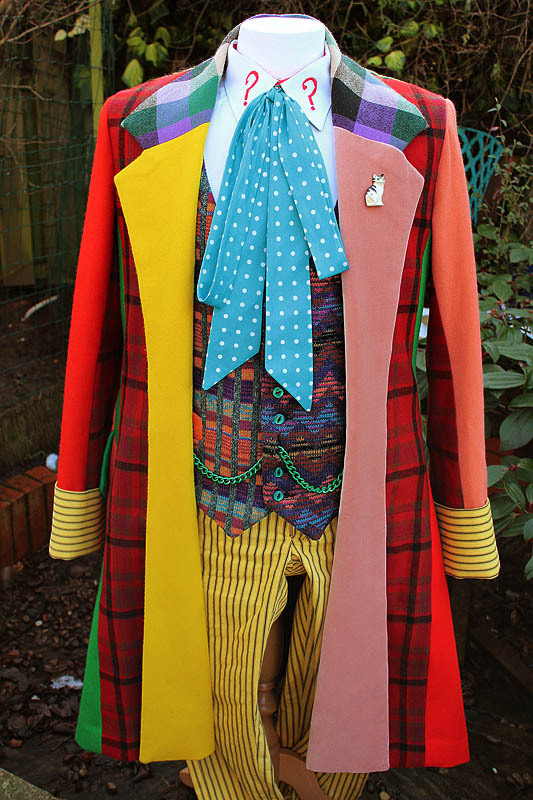 In fact that was a step up from when I did the Mk I Tennant Coat, which had been made on the floor of our spare room, spending my whole time hunched over the sewing machine. Not good for your posture I can tell you! From the Mk II I managed to get promotion to the kitchen table, as it was the only decent space in the house where I could lay out a large enough expanse of fabric to properly cut the cloth for a Tennant Coat and that has been where I have worked ever since (see above, while finishing the last garment made in the kitchen). This has been all very well, but after a while, and an increasing amount of work being taken on, it started to become a little unpopular with my partner, who would repeatedly find a light dusting of fabric fluff covering the work surfaces of the kitchen . . . There wasn’t really much I could do about this, as cutting and working with fabrics produced dust and fluff as well as stray off-cuts of cotton. Since I have started offering Five Trousers for sale, and knowing of some other projects I have in the pipeline, it became inevitable that I would need to find a dedicated room in the house to work in. Currently we have been using the third bedroom as a study/computer room, and our second/spare bedroom as general laundry room. A quick rejig moved the computers upstairs to the spare room, freeing up the study to become my sewing room, but I would need some proper furniture to work on. When I was using the kitchen table, it served for both laying out and cutting, as well as sewing (see right, while laying out the back of a Tennant Coat). This meant I had to plan my day and do all my cutting first before setting up the sewing machine for work. However, if I needed to re-cut a pattern piece and had to clear the decks from sewing before doing the cutting then set the sewing machine up again to sew. In this move I wanted to have a separate sewing and cutting table. Luckily the kitchen table was pretty sturdy, especially since my sewing machine is a fairly chunky, and when I am had been cranking away it set up quite a rocking action on the table. However, when buying a new table to use in the sew room, we needed to find something up to the job, but not too expensive - a cheap Ikea table would just not do it. 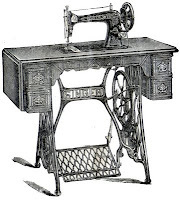 I then had a minor brain-wave, and realized the best thing to do would be to find a proper Singer treadle sewing table on eBay! As most stipulate a collection-only I had to limit my searches to a reasonable striking distance. It wasn’t too long before I found the “perfect” table. 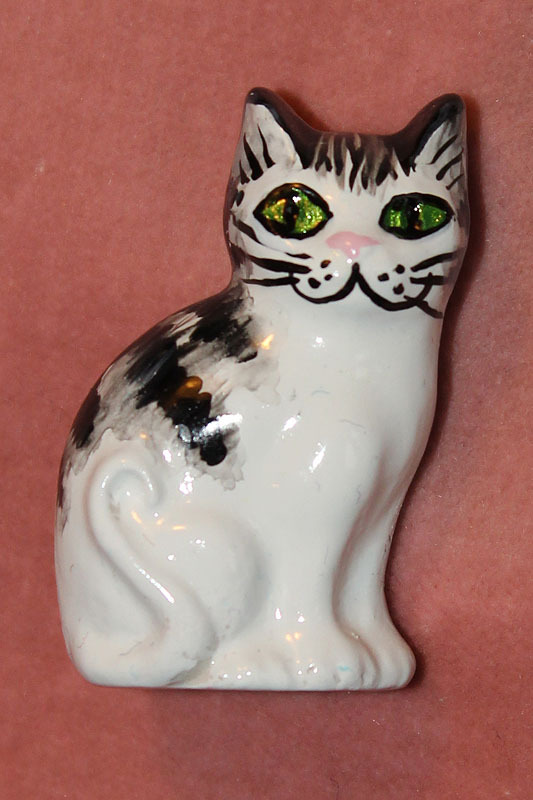 It had only been used as a piece of decorative furniture in a country cottage, so had been polished and looked after (see right, in-steu at seller’s house). It also, and more important for me, had three drawers either side where most only had one, giving me six drawers to store my bit and pieces as well as my treasured buttonhole attachment. This would make my move to the smaller sized study even more space efficient. 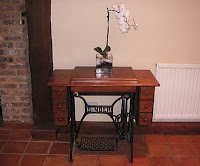 HAS BEEN USED FOR THE PAST 8 YEARS AS A PIECE OF FURNITURE IN A PERIOD PROPERTY. STILL IN WORKING ORDER ALTHOUGH THE RUBBER BELT THAT DRIVES THE TREADMILL HAS NOW BROKEN AND WOULD NEED REPLACING. HAS 6 SMALL DRAWERS AND MEASURES 37" WIDE, 29" HIGH AND 18" DEEP. A FEW KNOCKS AND SCRATCHES IN THE WOODWORK AND MACHINE HAS BEEN WELL WORN IN YEARS GONE BY. STILL A LOVELY PIECE OF HISTORY AND A GREAT LOOKING PIECE OF FURNITURE. PLEASE NOTE: THIS ITEM IS READY FOR COLLECTION BETWEEN TUESDAY 1ST SEPTEMBER AND TUESDAY 9TH SEPTEMBER ONLY - DUE TO HOUSE MOVE. I bided my time and bid for it on the last day and managed to snipe it for £77, which although it was maybe a little more than I had hope to pay, did give me a table in good condition with above average drawer space. I was pretty chuffed to have won it. There then followed the irritating story that sometimes is all to familiar with eBay purchases. It was clearly mentioned in the listing that collection had to be between certain dates as the seller was moving house and this item would not fit in the living room of their new property. This was to be a good two weeks after the auction closed, which is all fine and up front. I paid straight away to ensure my part of the bargain was kept. I was given the sellers phone number and I called her to work out a date, which we set and I was to await the address when we confirmed a few days before collection. I waited until the week before to find I could not raise her on her mobile, and she consistently failed to respond to my messages and emails. I was getting worried. I didn’t want to loose out on this table so did not want to file a non-recipt claim. Then, suddenly two days before the planned collection date I got a text message from her to confirm the pick-up, but with no address details. I replied with no response and it wasn’t until the night before collection did I finally get an address to go to to collect. We went along and picked up the table with surgical precision - in and out with minimum of fuss - I was just relieved to finally get my new sewing table after waiting for nearly three weeks. We got it home, lugged it up the stairs and put it in its final resting place in pride of place in my new sewing room. It looked fab! The table came with a 99K machine already in place which had never been used (see left). It is a much later machine to mine and has a pill-box bobbin rather than the shuttle type I am used to and prefer. The machine was no real use to me, not even for spares, so I took it off and put my prized 27K in its place (see right). I knew from the listing that the leather strap that would power the sewing machine had perished and was no good. A quick eBay search found a seller who stocks newly made spare parts and had a suitable treadle belt I could use. It was on a Buy It Now, so I had possession of it in a couple of days and I was able to give it a go. I had never operated a Singer using a treadle before, so it was a steep learning curve to say the least. After finding that you need to manually start it off to get it turning in the right direction, I was soon rocking away with my feet with both hands free to handle the work being sewn. Great as this is, I think even when I am proficient at it, I will still hand-crank some of the more delicate and critical part of my tailoring, as the treadle can run away with you and before you know it you are steaming though beyond where you wanted to stop. Finally, we had a spare drop-leaf table, which although was not as strong as the kitchen table, did give a equal opened area on which I could cut. Since the sewing machine has its own dedicated stand, this table is more than suitable for what I need, so I now have my desired separation between cutting and sewing (see right). I now have an area where I can work (in peace) and out of the way, though it is smaller on the inside compared to the kitchen. Wish I had Time Lord technology . . . 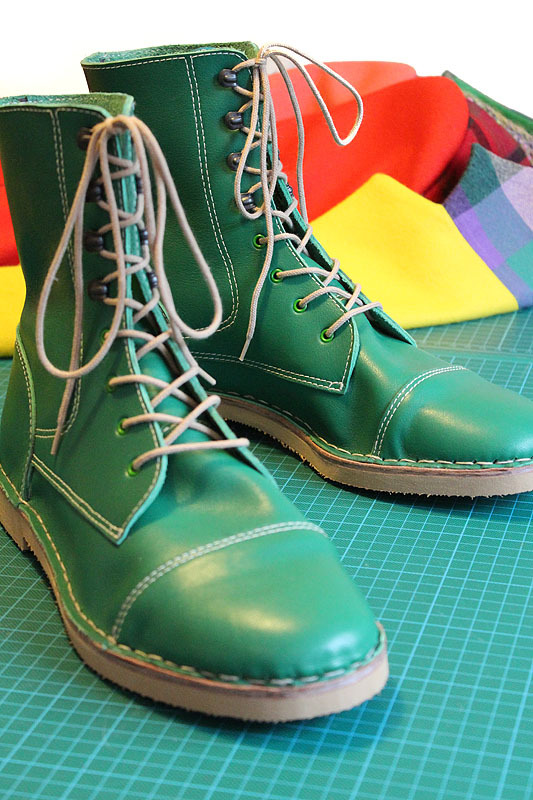 It's pretty cool to hear that all your work comes from that sewing machine. As fancy and as crazy as today's machines are you're still able to create some GREAT clothes from these classic machines! Keep up the great work.